We have carved a niche amongst the most trusted names in this business, engaged in offering a comprehensive range of 2 Burner Cooking Range . We are manufacturing high quality and pressure tested fabrication components for our customer satisfaction. Promt delivery , durablity and compatetive rates. Preethi Kitchen Appliances Pvt. 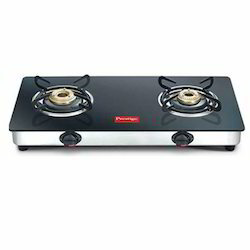 Ltd.
Our company has achieved laurels in offering a quality assortment of LPG Stove that requires very low maintenance.